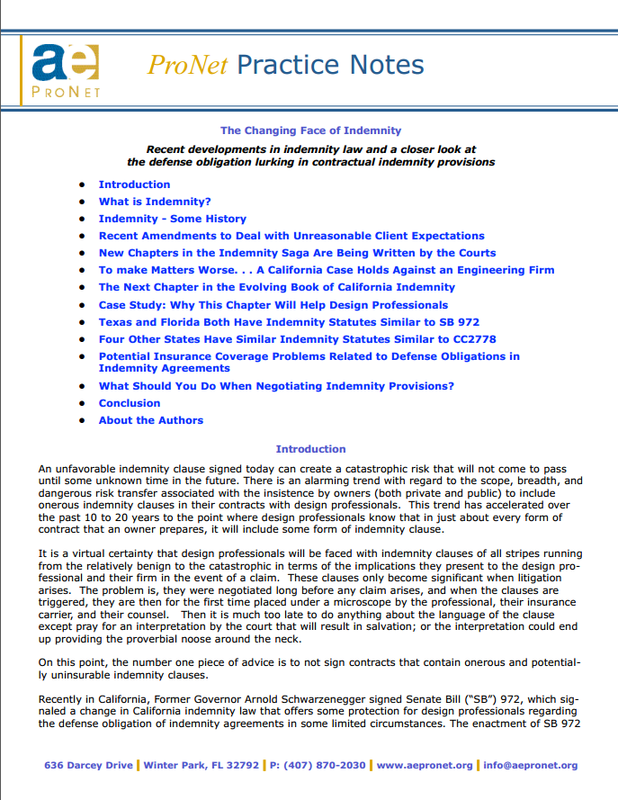 In-depth white papers providing real details on complex issues related to design professional liability and risk management. In 1985, after five years prosecuting criminals as an assistant US attorney, I became deputy general counsel of The American Institute of Architects. On my very first day, I was introduced to civil law. In his gravelly voice, the general counsel explained to me that the key to success in my new position was to “think liability”. I understood, as the traditional casebooks teach in law school, that appellate decisions in commercial cases tend to focus on determining where something went wrong and deciding who should be blamed. Liability was the proverbial ‘hot potato’, something to be avoided at all cost. As a result, lawyers teach and are trained to concentrate on anticipating potential liability and finding ways to avoid or transfer it so their clients are not caught in its web. The general counsel wanted me to think the same. 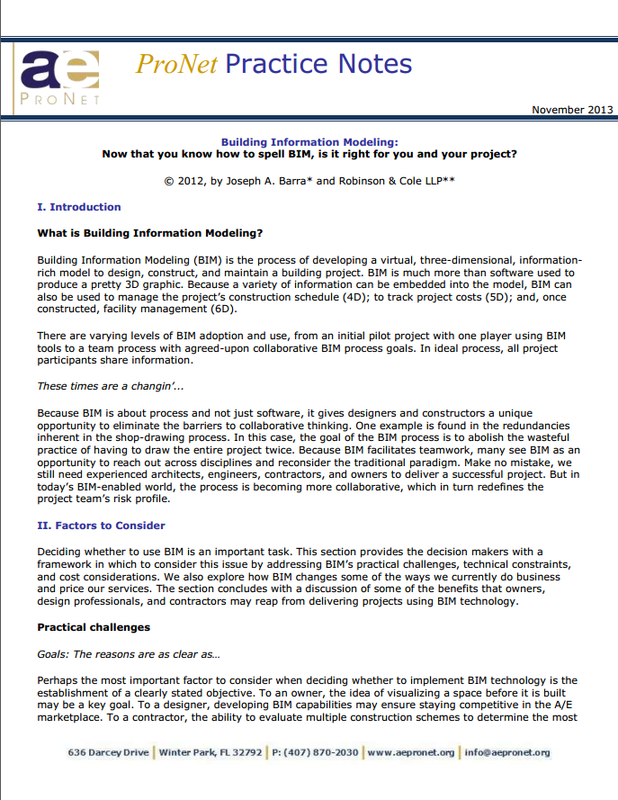 Building Information Modeling (BIM) is the process of developing a virtual, three-dimensional, information-rich model to design, construct, and maintain a building project. BIM is much more than software used to produce a pretty 3D graphic. Because a variety of information can be embedded into the model, BIM can also be used to manage the project’s construction schedule (4D); to track project costs (5D); and, once constructed, facility management (6D). While money isn’t everything, it is the measure and fuel of any business, including a design firm. Without payment for services firms suffer, starve, and even die. 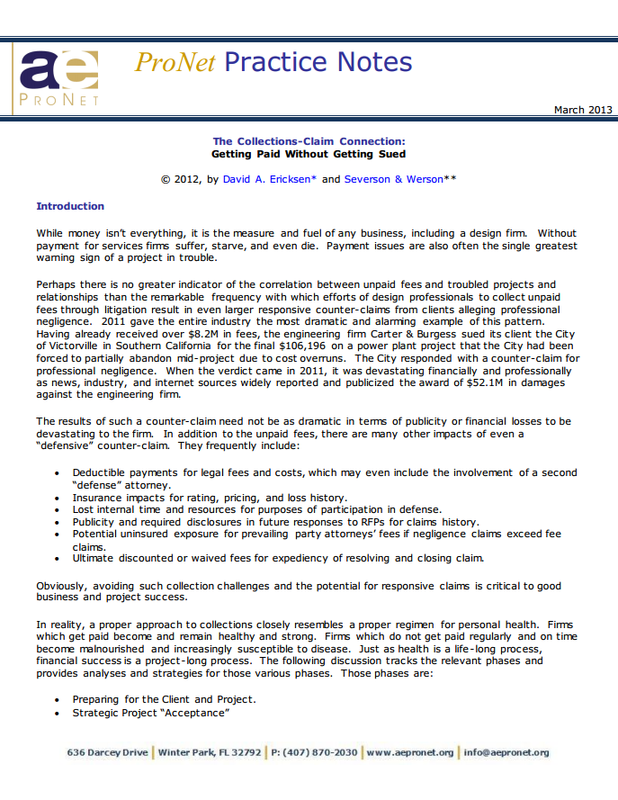 Payment issues are also often the single greatest warning sign of a project in trouble. An unfavorable indemnity clause signed today can create a catastrophic risk that will not come to pass until some unknown time in the future. 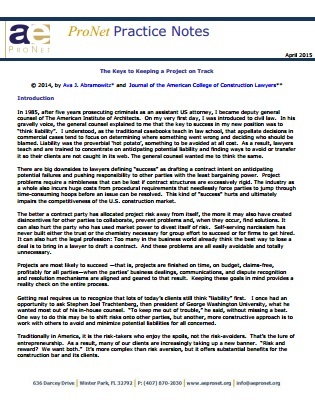 There is an alarming trend with regard to the scope, breadth, and dangerous risk transfer associated with the insistence by owners (both private and public) to include onerous indemnity clauses in their contracts with design professionals. This trend has accelerated over the past 10 to 20 years to the point where design professionals know that in just about every form of contract that an owner prepares, it will include some form of indemnity clause. 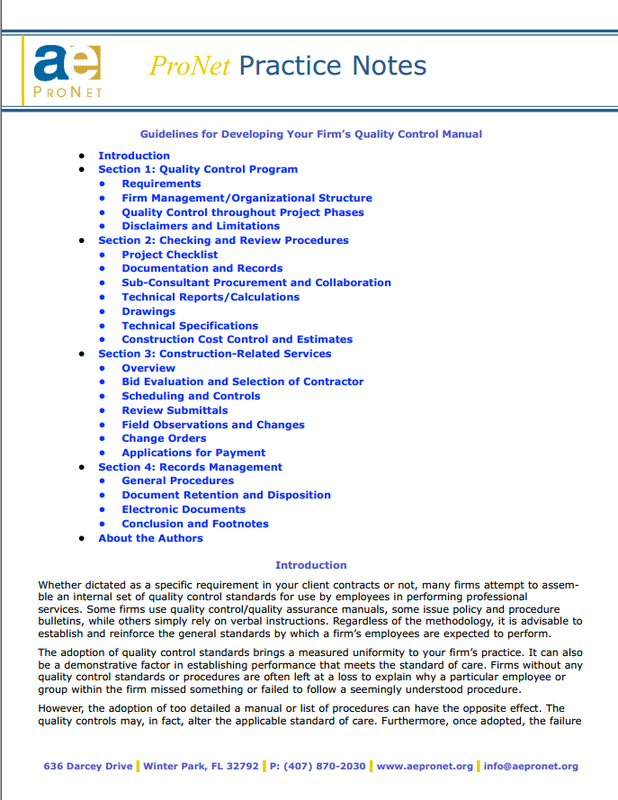 Whether dictated as a specific requirement in your client contracts or not, many firms attempt to assemble an internal set of quality control standards for use by employees in performing professional services. Some firms use quality control/quality assurance manuals, some issue policy and procedure bulletins, while others simply rely on verbal instructions. Regardless of the methodology, it is advisable to establish and reinforce the general standards by which a firm’s employees are expected to perform.